All amino acids used in protein synthesis must be in the l-configuration. Nevertheless, animals are capable of utilizing some d enantiomorphs. Indeed the widespread commercial supplementation of diets with methionine has been accomplished with the racemic mixture. 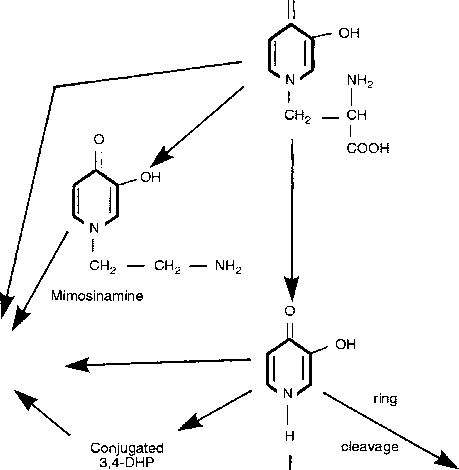 Two steps are essential in the utilization of d-amino acids: firstly, the d-isomer must undergo oxidative deamina-tion to the corresponding a-keto acid analogue; secondly, this analogue must then undergo l-specific reamination by means of an appropriate aminotransferase reaction. There are no aminotransferases for lysine and threonine in animal tissues, hence the d-isomers of these amino acids are not nutritionally active (Table 1.4). Of all the damino acids that are convertible by animals, d-methionine is the most effective in replacing its l isomer. However, marginally better efficacy may still be observed with l-methio-nine in comparison with d-methionine or dl-methionine when levels below the requirement are employed (see D'Mello and Lewis, 1978). In addition, when racemic mixtures of other amino acids are used, d-methionine becomes less effective than the l-isomer. Species differences in d-amino acid utilization should be recognized. The mouse utilizes i> and dl-methionine less effectively than other animals, whereas both the rat and the pig use d-tryptophan more efficiently than the chick. It is apparent that the mouse is an unsuitable model for validating the efficacy of d-amino acids for other species of animals (Table 1.4).